Welcome to A&B Homemaker where we are redefining the modern homemaker though recipes, thoughts, and ideas! Today we are making a super easy and cheap homemade garlic bread. This super simple recipe is easy to remix and make your own and really cater to your specific needs and desires. I also love this recipe because it is easy to freeze and store for later! Just prepare your bread and throw it in a zip lock bag before baking. Then when you’re ready just throw it in the oven! It’s just wonderful! In additional to the amazing garlic bread, we’ll also discuss key life lessons I’ve learned around knowing and owning myself. Like so many of us, I’ve spent a good deal of time reflecting on who I am and what shaped me. One of the key life lessons I’ve learned is the importance of knowing and owning who you are. 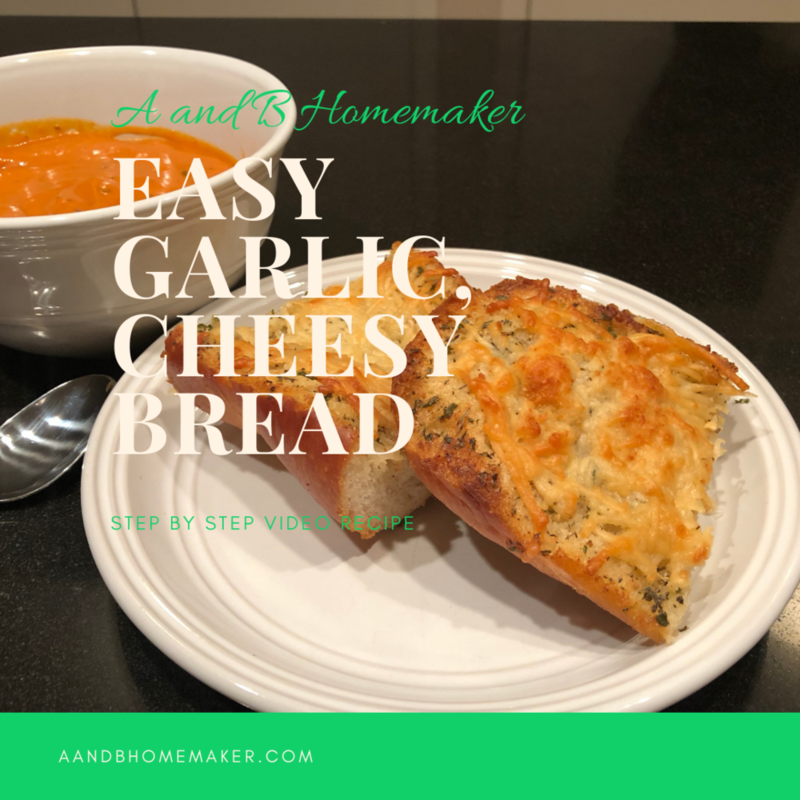 Take a moment and check out the video for a more in depth discussion of the key life lessons along with a step by step walk through of the garlic bread recipe. I hope you all try out the recipe and explore who you are created to be. Share your feedback in the comments. I'd love to know what you think! A delicious, moist red velvet cake that is sure to become one of your favorite dessert recipes. Welcome to A&B Homemaker! I'm excited to share one of my favorite desserts...Red Velvet Cake! 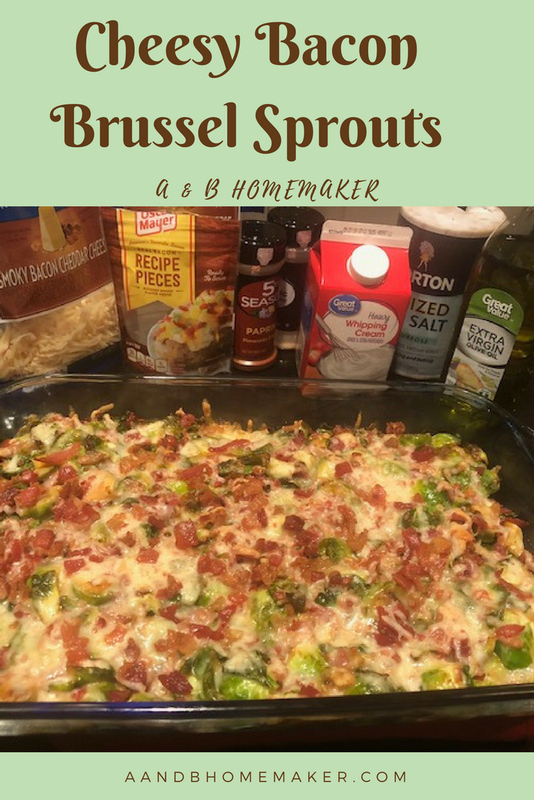 You don’t want to miss this recipe! I love red velvet cake because it is a chocolate treat without being overly sweet. 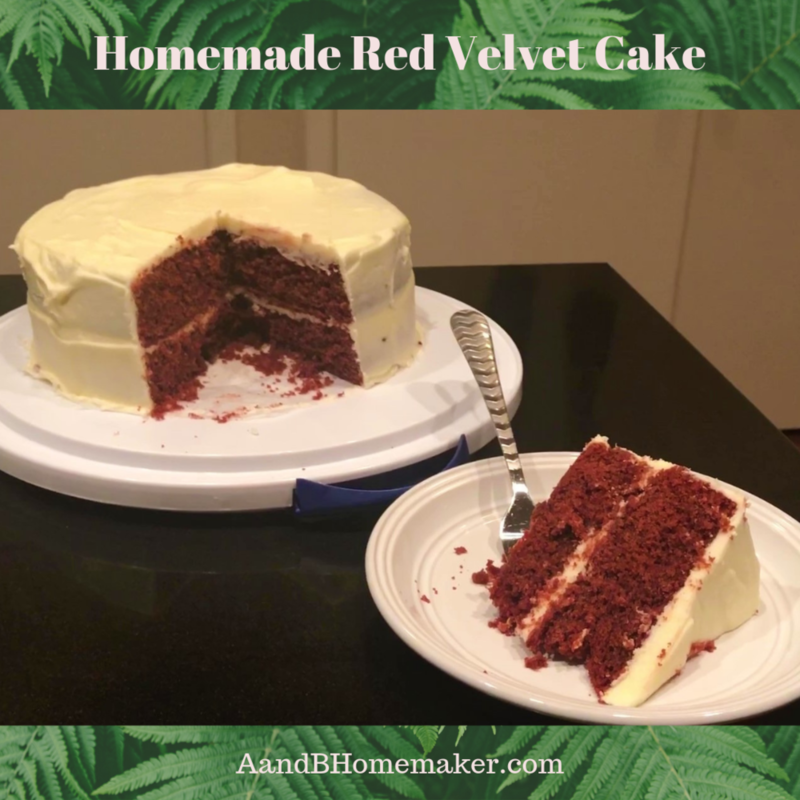 Take a moment and check out the video where we explore the topic of boundaries along with a step by step recipe for a moist red velvet cake. 2 Mix all dry batter ingredients together in a large mixer bowl. 3 In a separate large bowl, mix together all wet ingredients on low. Coarsely chop Ghirardelli chocolate bar. Melt chocolate with heavy cream in a glass bowl in the microwave on the lowest setting, stirring thoroughly every 30 seconds until smooth. If there are just a few lumps left, don't nuke it again, just keep stirring and they'll melt right in. Add chocolate ganache to wet mix and blend with mixer. 4 Add dry ingredients to wet mixture 1/3 at a time, mixing in between on low setting. Mix until batter is smooth. 5 Fill cake pans evenly and place pans in oven and bake for 25 minutes or until toothpick comes out clean from center of each cake. 6 Remove pans from oven and allow cakes to cool in pan for 15 minutes. 7 Allow them to cool completely on a wire rack or counter before frosting. 8 Add icing and enjoy!! 1 Using a stand mixer or electric handheld mixer, combine softened cream cheese and butter. Mix until well blended and smooth. 2 Add vanilla extract. Mix well. 3 Add powdered sugar 1 cup at a time, mixing well in between to really incorporate the sugar. This process will ensure a smooth texture. 4 Add 1 TBSP very cold heavy whipping cream. Beat well for fluffiness. 5 Chill in refrigerator until cakes have cooled completely before frosting. Chilling the frosting also helps it gain more structure when piping since we softened the cream cheese and butter earlier. I hope you all take the try out the recipe and share your thoughts on boundaries in the comments. Hi! Welcome to A&B Homemaker! This is a space to explore ideas, recipes, thoughts and so on. Today we are going to be making a Caramel Cake. The My grandmother had a stellar scratch caramel cake recipe that my entire family loves to talk about. Unfortunately, my grandmother passed away when I was 6 years old and no one saved the recipe. So a few years ago I was really excited to try and find the perfect caramel recipe. After some trial and error I have a recipe that was a hit with my family. I mainly adapted my version from this recipe. I’m excited to share what I’ve learned with all of you. Working on this recipe was important because I wanted to find that part of my family's history that was lost. The older I get the more I evaluate and value family, legacy, and tradition. So be sure to check out the video where I share and explore the idea of legacy. The video will also give you a step by step guide through the entire process. This may come in particularly handy when making the caramels. Place 1/2 cup of the sugar in a skillet over medium-high heat, stirring constantly until the sugar melts. When the sugar becomes a dark amber color (about 5 minutes- watch it closely), remove from heat and whisk in the hot water VERY slowly until dissolved. You’ll be left with a syrup about the consistency of simple syrup. Let it cool completely. *The first time I tried this I added my hot water too fast and ended up with a rock-hard lump of caramel, so be sure to add the water VERY slowly while whisking! In a separate large bowl or a standing mixer cream the butter and the remaining 1 1/4 cups sugar until light and fluffy, about 2 minutes. Add vanilla, oil, and the cooled caramel syrup; blend. Add dry ingredients and milk alternately, beating until smooth. Bake for about 25-30 minutes, or until a toothpick inserted in the center comes out clean. Cook the sugar, butter, cornstarch and half and half together in a double boiler until thick (mine never got too thick and I cooked it for at least 15 minutes). Remove from the heat and add vanilla. Let cool for about 5 minutes then pour over the warm cakes still in their pans (I poked holes all over my cakes with a toothpick so it would soak up the liquid better). Let the cakes sit out at room temperature in their pans until completely cooled. Over medium-high heat add granulated sugar and water in a small saucepan and bring to a boil. Continue cooking, without stirring, until mixture turns dark amber in color, about 6 to 7 minutes. It will bubble and I normally gently move the pan to mix the bubbling mixture to ensure it cooks evenly. Remove from heat and very slowly add in cream and vanilla, stirring with a wooden spoon until completely smooth (be careful, as the mixture will definitely bubble up and possibly splatter a bit as you add in the cream). Set aside until cool to the touch, about 25 minutes. Beat the butter in the bowl on medium-high speed until fluffy, about 2 minutes. Reduce speed to low, gradually add powdered sugar, and mix until completely incorporated. Turn off the mixer, and then add caramel. Beat frosting on low to combine, and then increase to medium-high and beat until airy and thoroughly mixed, about 2 minutes. Refrigerate if not using immediately (or to harden the frosting a bit). I hope you all enjoy the video and try out the caramel cake. Of course, let me know your thoughts and remixes in the comments below. Hi everyone! Welcome to A&B Homemaker! This is a space to explore some home care ideas and techniques. 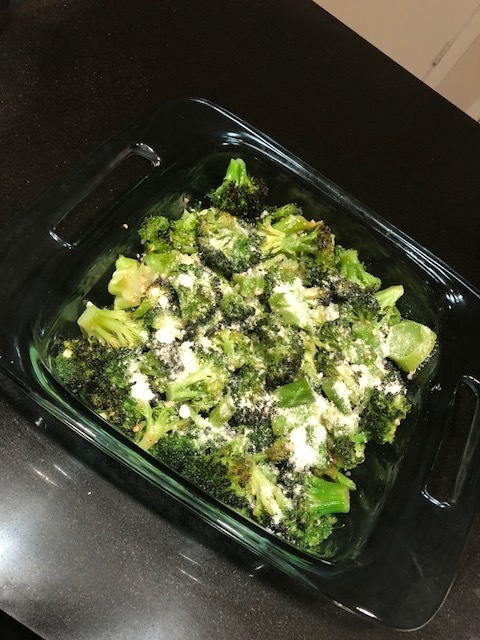 I'm Adrianne and I want to share some recipes and cooking adventures along with a few things that I've been thinking about. Now, to clarify, I'm not a professionally trained chef, so most of the recipes are flexible. If you feel the need to add more or less of something...go for it! Make it your own! Today we'll be making a super simple Creamy Kale & Mushroom Pasta. I typically make this with pearled couscous but today we are going to remix it with some bow tie pasta. I’ll also be sharing some tips to navigating our environments and spaces as we grow, develop, and evolve just like this recipe. Check out the video for a walk through of the recipe below along with my thoughts on balancing your growth and evolution while remaining in old, familiar spaces. Add coconut milk and Seasonings. Mix well. I hope you all enjoyed the recipe and the verbal journal-ing of my thoughts on how to bring an old you into new spaces. Let me know what you think about the recipe and how you balance your evolution in the comments! This vegan Kale and Corn Chowder recipe will warm your cool fall afternoon and chilly winter evenings. 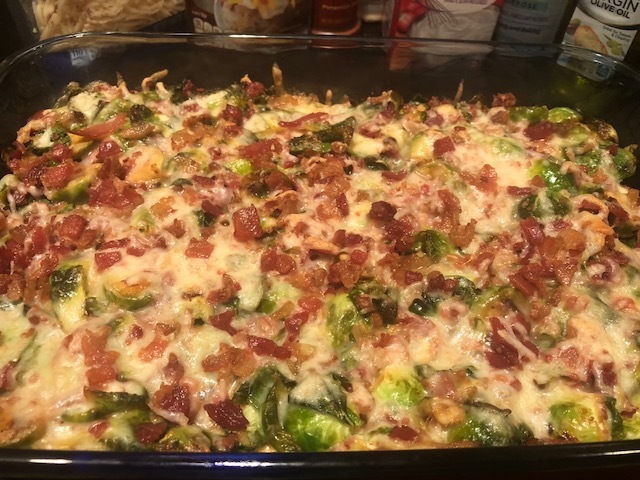 This is a great alternative to one of our favorite and classic comfort foods. Well it is that wonderful time of year when the cold weather is settling in and the leaves are changing colors. We bring out our favorite boots, sweaters and even scarves. Of course the cool weather means we get to bring out our favorite class soup recipes and even try out some new ones! I love curling up on the couch with a sappy rom-com movie and a bowl of soup that warms my body and my heart. Some of my favorite soup recipes are for lobster bisque soup and chicken corn chowder soup and even chili. While I love my classic warm soup recipes, I’m currently on a gluten free, vegan journey so many of my favorite recipes don’t fit within the new dietary boundaries. Most of us are familiar with the gluten free, dairy free, or meatless options. While it can be difficult to make the transition to eat without some of our favorite items, many of us don’t have a choice. So as much as we love our creamy soups topped with bacon, crackers and melted cheese. Now we have a delicious alternative to our classic chicken corn chowder soup. The gluten free, vegan kale and corn chowder is a hearty, warm bowl of creamy vegetables and potatoes. It provides all of the warmth and comfort with a twist. Heat olive oil over medium heat. Add onions and cook until soft. Stir occasionally. Add garlic and cook for an additional 3 minutes until fumes potent. Add bell peppers and continue cooking for 3 minutes. Add kale and vegetable broth. Mix ingredients and cook for 3-5 minutes or until kale shrinks. Add potatoes and coconut milk and stir ingredients thoroughly. Add seasonings and mix well. Lower heat to low and allow soup to cook with top on for about 30 minutes or until potatoes are soft. A simple and sweet, cinnamon apple flavored liquor drink recipe to boost your fall parties and holiday fun! As fall approaches, the leaves begin to turn into burnt oranges, bold reds, and golden yellows. We enjoy the brisk chill breeze that flows through the air. We go to the back our closets to pull out our favorite warm blankets, flannel button ups, fuzzy socks, and boots of all kinds. Of course, we also need our go to comfort foods! The foods that have a rich warmth that makes you feel cozy all over. The foods that remind us of home, family, friends, and laughter. Some of our favorite go to recipes are delicious chili and chicken corn chowder soup. The best thing to follow our favorite comfort foods is something sweet paired with a perfectly blended liquor medley. This is key to completing the perfect fall experience. What is a better dessert than classic apple pie?! Apple Pie is one of the classic desserts that’s sure to please the crowd. The warm,cinnamon flavored apples in a sweet apple filling and warm flaky crust. Topped with the perfect scoop of vanilla ice cream. How can you go wrong? All you need to add is your liquor refreshment of choice. Here is the perfect combination! Apple Pie in A Glass! A simple, two ingredient blend that creates the sweet warmth of cinnamon apple pie and melting ice cream in a liquid, liquor form. Now you can have the same sweet, cinnamon apple flavor with a every sip and a light tingle at the end of the glass. 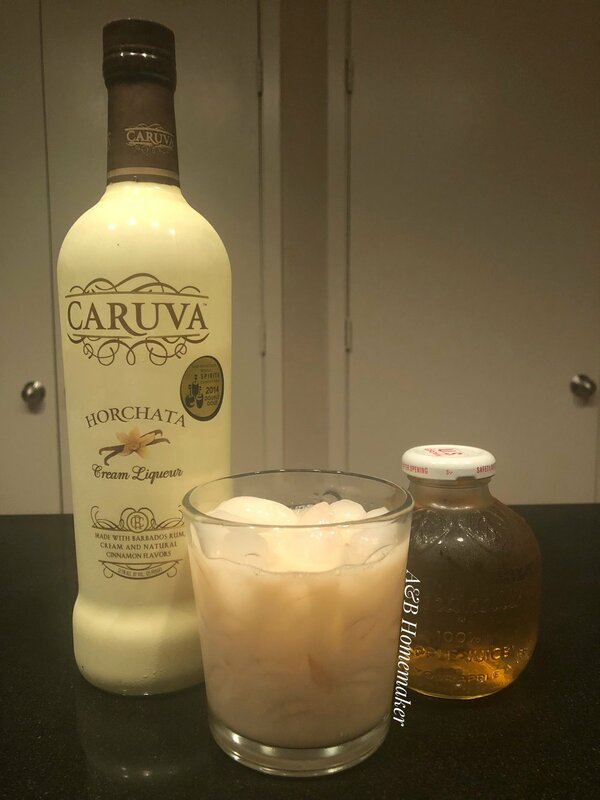 Simply mix your favorite apple juice or cider with equal parts Horchata or RumChata. 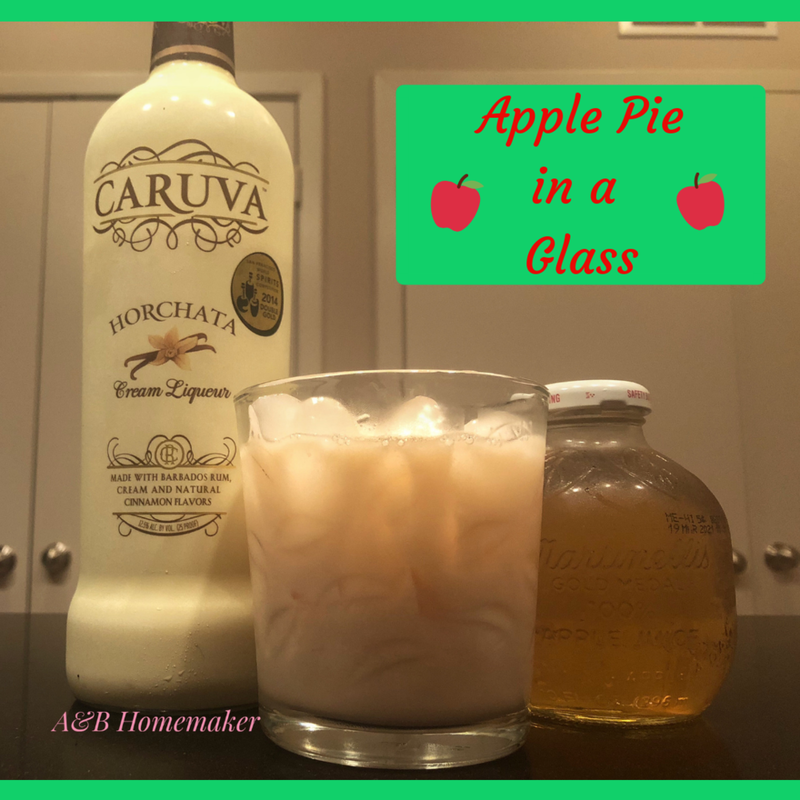 The sweet cinnamon flavor of Horchata blends perfectly with the apple cider to create the sweet cinnamon apple pie in a Glass. The steps and ingredients are super simple! Mix and served chilled or over ice. A quick and easy recipe that for dinner that can stand alone or pair perfectly with meat. Hello! I have been playing around with various recipes that include some of my favorite foods, kale and mushrooms. Both seem to have a love/hate dynamic with most people. Either they love kale or they hate kale. They absolutely love mushrooms or they can’t stand them. I happen to love both! I grew up loving spinach. It was one of my favorite vegetables. But toward the end of college spinach turned on me! All of a sudden I was experiencing an allergic reaction to spinach. So I begrudgingly began to explore substitutes and found kale. It didn’t take long before kale was a staple in my diet. Howsoever, that doesn’t mean I don’t still try to love spinach it, I just continue to experience worsening allergic reactions. As for mushrooms, I grew up believing they were the worst thing to come upon the earth! I could barely even get them into my mouth let alone eat them! But, as I got older I discovered that some of my tastes had changed. Also, after discussing my level of disdain for certain foods a friend pointed out that my issue seemed to be rooted in texture, not flavor. With that in mind I began to retry so many things. And surprise, surprise...I love mushrooms! So here we are looking at kale and mushrooms coming together to become best friends in this recipe. 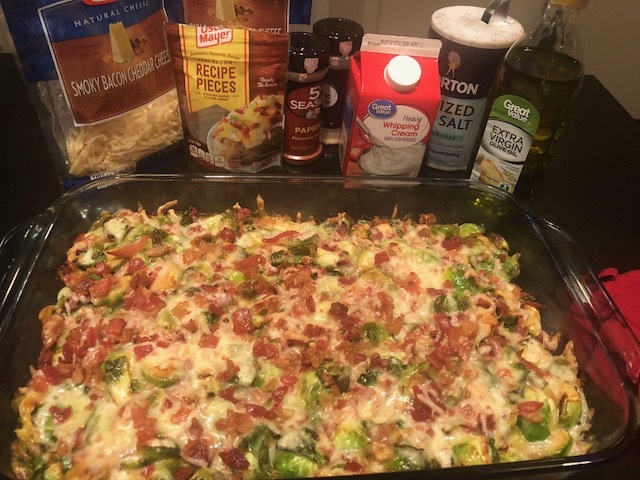 The recipe is super simple and I tastes great! I also love it because I can eat it by itself or pair it with steak or chicken. So it works even when I’m on a meatless detox. It’s also super simple, so you can add and remix items and you see fit! Saute onions and garlic in butter until onions become light brown. Stir occasionally. Add mushrooms and stir. Let them cook for about 2 minutes. Add kale and broth and mix with the vegetables. Stir occasionally until kale shrinks. Add cream and stir until all ingredients are evening mixed. Allow cream to simmer and slightly bubble with minimal stirring to thicken the sauce. Plate cooked couscous on a plate. Add mushroom and kale mixture to the top. Sprinkle cheese on top if you wish. 2018 is a new year and a great time to start focusing on your health and increasing our vegetable intake. 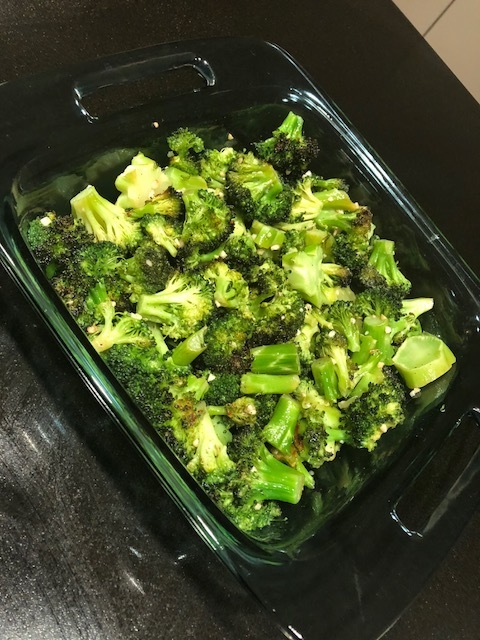 Below is a simple and fast recipe for roasted broccoli. A simple, step by step recipe with pictures for the perfect cinnamon rolls. These sweet, sticky cinnamon rolls are sure to be a crowd pleaser. For the past several years I've been practicing my baking skills. Especially, baking from scratch. Yeast, rolling out dough, letting it rise, and so on and so forth. When I was in college I started adapting this recipe for homemade cinnamon rolls. The cinnamon rolls are a flaking, sweet treat that has consistently been a huge hit with my family. And they can be quite picky, so for everyone to love something is a major success. Since that discovery I've been making them every year for Christmas breakfast. Who doesn’t love breakfast? It’s not only the most important meal of the day, but it’s the best meal of the day! Of course, you can do breakfast in the morning, a brunch, and for dinner. And a sweet breakfast treat is the perfect ending to any meal. Cinnamon rolls fit as the entire breakfast, the sweet ending to bacon and eggs, or even a post dinner dessert with coffee. The recipe is simple, but it is a time commitment. It’s a great starter recipe if this is your first extensive baking adventure. The steps are easy and the pictures will help guide you. However, because some of the steps require extended periods of time, I suggest you read the entire recipe so you can plan accordingly. I personally hate to be rushed, so I make most of it at night and leave the final baking step for the morning. This plan allows me to take my time to prepare and still serve fresh, hot cinnamon rolls. This recipe is a simple, step by step guide to sweet and sticky cinnamon rolls along with tips on making this baking adventure successful. 1. In a small bowl dissolve 1/2 tablespoon of sugar and yeast packet in warm water. Stir slightly and let's stand until it's creamy/foamy. This will take about 10 minutes. 2. During those 10 minutes warm your milk in a small sauce pan until it begins to bubble. Then reduce the heat and mix in 1/4 cup of sugar 1/4 cup of butter and a pinch of salt (no more than a teaspoon). Stir the mixture until everything is melted and smooth. 3. In a large bowl combine the yeast mixture, the lukewarm milk mixture, eggs, and 1 1/2 cup of flour and combined well. Continue to add flour 1/2 cup at a time (about 4 cups total) and stir well until the dough has pulled together (see pictures). You will know you have enough when the dough is difficult to stir and becomes more firm. 5. Oil a large bowl and place the dough inside of the bowl. Ensure that all of the dough is lightly covered with oil. Place a damp towel over the bowl and set-aside until the dough has doubled in size. This will take about an hour. 6. While you're waiting for your dough to rise melt about 1 cup of butter in a small sauce pan over medium heat. Once the butter is melted stir in 1 cup of brown sugar and whisk until it is smooth. Pour the mixture into a greased 9 x 13" baking pan. Then melt 1/4 cup of butter and set aside. In a separate container combine 1 cup of brown sugar and 2 tablespoons of cinnamon and mix well. And set the mixture aside. 7. Once your dough has doubled in size set it onto a lightly floured surface and roll into a large rectangle (about 18x14"). Brush the dough with the melted butter leaving about 1/2 inch border. Then sprinkle your cinnamon and brown sugar mixture evenly across the dough covered in butter. 8. Begin rolling your cinnamon rolls along the long side. Ensure you roll the cinnamon rolls tight to avoid gaps. As you roll add butter along the bare side of the dough for to help hold the roll together (and for additional moisture and flavor). 9. slice your cinnamon roll into 12 to 15 different sections. Place each of the rolls cut side down into your pan with the butter and brown sugar mixture. Cover your cinnamon roll filled pan with your damp towel and set aside until the cinnamon rolls have doubled in size. (See the picture.) This will take about an hour. 10. Preheat your oven to 375°F. Once the cinnamon rolls have doubled in size place them in the oven to bake for between 25 and 30 minutes or until they are golden brown. Once ready take them out of the oven and let them rest for 3 to 5 minutes then flip onto serving platter or wax paper. I hope my directions are clear and helpful. If you have any suggestions or difficulties feel free to leave a comment below. Enjoy!